What Happens When Students Become Teachers? As of this writing, I am 28 years old and teaching a class in the K-State Women’s Studies Department that I love more than anything – Women and Disability. Teaching in this department is surreal; it was in this department that I learned what women’s studies was and the depth and breadth of possibilities available to me through this course of study. I earned a dual bachelor’s degree in Women’s Studies and English in 2012, a graduate certificate in women’s studies in 2014, and here it is, 2016 and I’m writing my own curriculum, teaching the class that I so badly wanted to take, and working with the best students in the world (okay, I might be a bit biased). During the 2008-2009 school year, I was returning to Kansas State University after a car accident that left me permanently disabled. A once-familiar campus suddenly felt almost malevolent, a body I had always struggled with loving was now scarred and even more outside of the norm, and my trajectory was unclear. I felt embarrassed about my disability and its visibility and unsure of myself. Everywhere, that is, except for the women’s studies classroom. In my very first women’s studies class, I found myself questioning what I thought I knew about the world, speaking my own truth, and finding my voice. I joined FIRE and I spoke at Take Back the Night about my experience as a woman with a disability. I learned to research and think critically and ask questions. I began to speak up about the things I always somehow knew weren’t quite right but could not put into words. I became an activist, an educator, and I learned how difficult concepts like solidarity and coalition can be when you live them yet how rewarding it can be to truly come together to create change. When I first came to K-State in 2006, I had only a vague idea of a future. I majored in psychology and lived in the dorms, but didn’t feel like I had much of a place. I even considered transferring. Now, in 2016 here I am, still at K-State, talking to my students about gender, disability, sexuality, race, class, and laughing and learning and even crying with them. Having a degree in women’s studies has allowed me to explore my options. 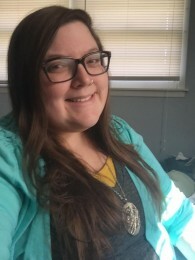 Since graduating in 2012 I have earned a master’s degree and two graduate certificates, worked for a political campaign, at the Crisis Center, and as a copy editor, and taught the first disability studies class offered in our department. Through women’s studies and K-State, I have had the chance to explore who I am, what I want to do, and where it is that I can do the most good in the world. Right now, that place is here, in Kansas, where I recently accepted a full-time position as an advocate for victims of domestic violence and sexual assault. In the future, it might mean a Ph.D., so I can return to the classroom and hope to someday find a place in a department even half as fabulous as this one. However, one thing remains true: a women’s studies degree is more than a piece of paper. It is a way of seeing, moving, and being in the world that will open up opportunities you wouldn’t believe and lead you down paths unknown yet full of wonder.